Livebearers are colorful fish that love to breed in your planted aquarium. This group of beautiful little friends includes Guppies, Platys, Mollies, and Swordtails. They can be kept alone, but are much more interesting in groups. With this type of fish, the key word to remember is breeding. These little aquatic friends are usually in an endless spawning cycle and can produce thousands of baby fish. The most interesting thing about the breeding habits of these fish is that they do not lay eggs. The eggs develop inside the female fish and they give birth to live, swimming fry. This can, and usually does, produce hundreds of tiny baby fish. The colorful males will be in a constant courtship display and will not stop chasing the females during their entire life. That is why it is best to have several females for each male. Keeping to few females will stress and tire these little fish to a fatal point. Providing lots of tall and floating plants will not only provide this type of fish with a place to spawn, but it is also good for their health. They require vegetable matter to be active and healthy. They will nibble on your plants when they are not chasing each other around and making babies. Plants also provide the fry with cover when they inevitably arrive. These little guys are great fish for the community aquarium and are peaceful tank mates with like sized and larger fish. Take care that you don't keep aggressive fish with them because they make an easy meal for fish like Cichlids. Livebearers will usually get along with their own kind. Breeding these active little fish is very easy and can become a fun hobby in itself. Some, like Swordtails and Platys, can even hybridize creating whole new types of fish. Keeping schools of different species can sometimes result in an accidental genetic laboratory in your tropical fish aquarium. These wonderful, active little fish can produce many new kinds of aquatic friends for you to enjoy. Below are some common types of Livebearers. Look at their profile pages for more information. These colorful little fish multiply by the thousands. Elegant fish that may fin nip and need just a bit of salt to be healthy. Very calm in large numbers, these fish can hybridize with Swordtails. 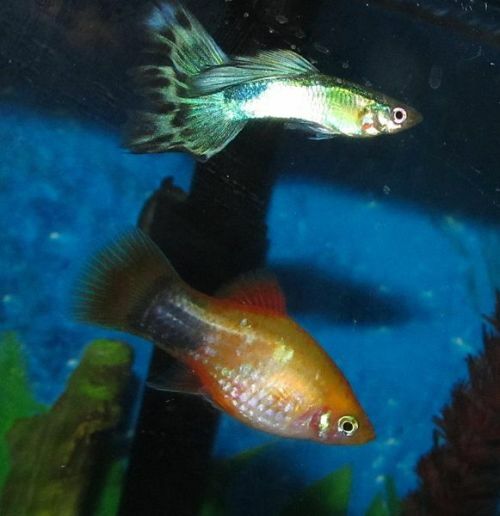 Colorful and shapely, these little guys can hybridize with Platys. For more information, go to Wikipedia's Livebearers page. Do You Have A Favorite Livebearer? We all have a favorite fish. Somewhere in your aquarium you have a fish that you are proud of. If you have a favorite friend that is a Livebearer, take a picture and share a story about it with us.